· How well a diamond is cut has everything to do with the brilliance, sparkle, & fire of a diamond. · The cut of a diamond is comprised of three elements: Proportions, Symmetry & Polish. · AGS is the only well respected grading laboratory that assigns a grade to a diamond according to the Proportions (cut) of a diamond. · The term for the standard round shape is “Round Brilliant”. · Ideal Cut means that a diamond has Ideal Proportions, Ideal Symmetry & Ideal Polish. Beware: We have found recent reports of Diamonds being called Ideal Cut, but only the proportions are Ideal. Would you call the stone below Ideal? Our opinion on color & what the majority of our customers have found. · We have brought in thousands of diamonds for customers. Of course we specialize in Ideal Cut diamonds, but due to budget constraints, some of our customers have insisted on looking at a non-ideal cut diamond as well. Time & time again these customers almost always went with the ideal cut diamond. · The weight of a diamond is meaningless if it is not cut properly. The most attractive beauty of a diamond is its ability to refract light and change it into a prismatic display. If a diamond is cut too deep, then it will look like a brick and have a weight like a brick. And instead of looking like a 1.00ct sized diamond, the weight of the diamond will be spread out into non-helpful areas. · We strongly recommend not sacrificing the quality of the cut of a diamond. If the right sized diamond is just out of reach, then considering other options such as going with a grade down in color or clarity in order to find the right diamond. 1. The 1st Aspect of Cut. Proportions. Starting with Proportions on an overall basis, let us assume that Diamond A weighs 1.00 carat, and Diamond B weighs .75ct. (100 points =1 carat). Looking at the below examples, which diamond would you want? Some people might say the 1.00ct diamond, but from the top, both diamonds spread out to the same dimensions. 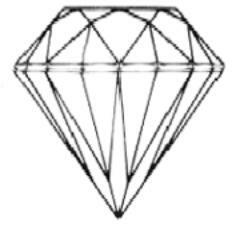 Well, if Diamond A were cut to ideal dimensions that particular diamond would weigh .75ct. So what’s the big deal about that? Could it be that you received a great value for that diamond and get to tell everyone that it is 1.00ct? Well, take a look at the below representations of what happens when light enters and exits both diamonds. Because of the steeper angles on Diamond A, light does not have a chance to reflect within the diamond and back out to the eye. BUT, keep in mind that since light is escaping out of the bottom of the diamond, light is also entering from the bottom!!! So why is this important? Well, diamonds are like little magnets for grease. It is going to be impossible to keep your diamond perfectly clean and when Diamond A gets dirty, it doesn’t look as bright or as sparkling as it did when it was absolutely 100% clean and in the showroom. Diamond B however acts like a mirror reflecting almost all of the light coming from above (which is pretty much where all light comes from). So even when Diamond A is dirty and hasn’t been cleaned, it will sparkle like it is on fire. The only benefit is bragging rights, but when the two stones are put head to head, Diamond B will put Diamond A to shame. According to AGS (American Gemological Society) a Non-Profit Diamond Grading Laboratory whose sole focus is to protect consumers, the cut grade of the diamond is determined by the worst factor given to the stone. So even though diamond #2 & diamond #3 both have an overall grade of 1, diamond 2 would be the much better stone. This also applies within the individual categories as well. 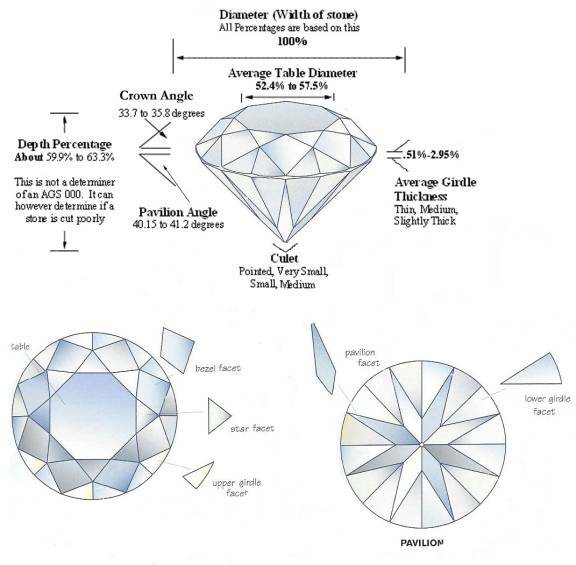 Diamond #4 could be cut to perfection, but if the girdle of the diamond were extremely thin at any one point, the proportion grade of the diamond is a 3 and therefore the overall cut grade of the diamond (assuming the symmetry & polish is 3 or less) is a 3. Girdle thickness is one of those double edged swords. Too thin and your diamond has a greater risk of chipping. Diamonds are one of the hardest substances in the world, but if it is wafer thin at one point, it is easy to imagine how a good solid blow could cleave off a precious piece. Too thick and it can be unsightly and add carat weight to the diamond. As the girdle is the widest part of the diamond, a thick girdle can really add weight to the diamond without adding any scintillation or sparkle whatsoever. All Prices & Items Subject To ChangeCopyright Canadian Diamonds Wholesale Ltd.